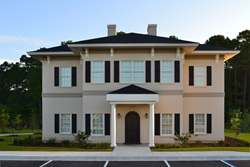 Construction was recently completed on the new location for Lowndes County’s premier personal injury law firm. The Studstill Firm, LLP has completed their move into a new state-of-the-art facility located at 4352 Kings Way in Valdosta. The office space was designed to provide a comfortable, relaxing and private environment for prospective clients as well as individuals and families currently represented by the firm’s accident attorneys. Located in the heart of Valdosta near the intersection of Old US 41 and Valdosta Rd, the office also incorporates the very best in technology to prepare cases for trial and maximize the value of client claims. Partner Justin Studstill explained, “We have earned a reputation for taking on big businesses and insurance companies, a task which requires the very best resources. Our new building is equipped with the latest technology so we can maximize our productivity and effectiveness on our clients’ claims.” The new law office building boasts two large conference rooms suitable for depositions, mediations and trial preparation, as well as a full kitchen for catering and meals. The Studstill Firm, LLP will host a grand opening celebration and ribbon cutting on August 25th at 10:00 a.m. sponsored by the Valdosta-Lowndes Chamber of Commerce. About Studstill Firm, LLP: With offices in Valdosta, Macon, and Nashville, Georgia, the Studstill Firm, LLP is uniquely positioned to provide convenient legal services throughout the state. The firm’s three attorneys have earned a reputation for obtaining excellent results on behalf of clients who have been involved in serious car, truck, and motorcycle accidents, as well as those with wrongful death and workers’ compensation claims. The firm is AV Rated by Martindale-Hubbell and has been providing high quality legal services in Georgia since 1980.